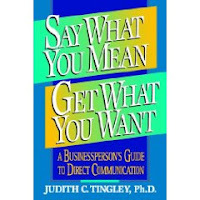 Available books for sale by Dr. Judith C. Tingley, Ph.D.
For more than 15 years, psychologist and consultant Judith Tingley has helped men and women at companies such as American Express and Blue Cross/Blue Shield communicate more effectively with each other. Encouraging readers to be flexible without sacrificing strength, this guide uses fascinating, everyday scenarios to show how to ease tension and increase influence through effective "genderflex" communication. "Are you hesitant to speak up at work? Do you come across too stridently? Are you afraid to say no? Do people tune you out when you talk? If you want to get people to listen to what you say—and do what you want—assertive communication should be your goal, says Judith Tingley. This book provides examples of typical workplace communications scenarios, as well as two self-tests to help readers assess their present levels of directness. Readers will discover eight steps for effective communication and learn how to evaluate their goals from a communications standpoint."